This month has been full of blessings and activity. 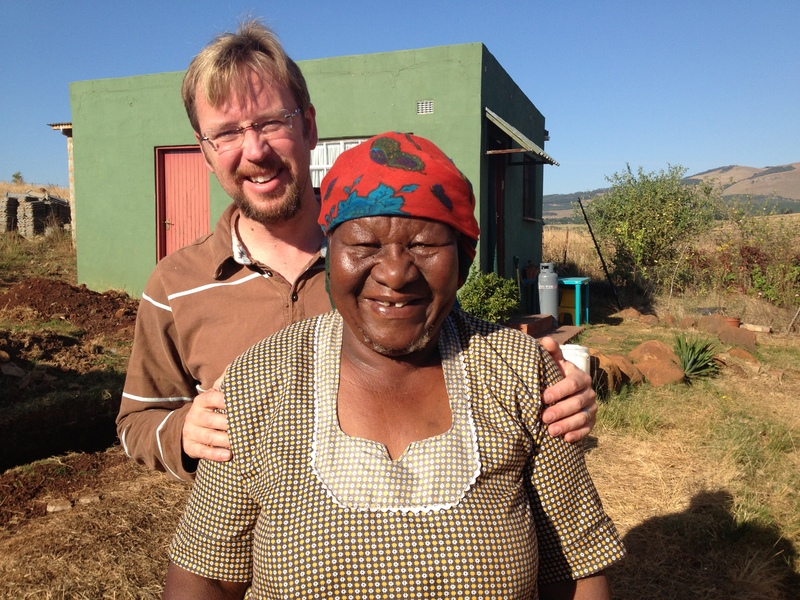 At the beginning of the month we took Gogo (Phumlani’s mum) to Newcastle to her daughter. Gogo was going to the hospital as there as it is possible that she may have cancer or some other serious illness. She has had a difficult time at the local hospital due to incompetence and other factors. One month she was sent by the local hospital to Pietermaritzburg who then sent her back saying that the doctor’s note sent with her was not legible so they did not know what they were being asked to do. Please pray for Gogo in this regard but more importantly for her salvation. We have witnessed to her numerous times and Phumlani often. Also please pray for Tholakele who is now in work. Her husband left to work in Gauteng and she has been left to look after her 4 children without any support from him. She has been in work for a little while and so we have not been able to see her much. Last week we found out that she is having to live near her work place and hardly gets a day off. So her children are looking after themselves. We are going to visit her as soon as she is available to see if there is any way we can help her to be with her children and to get more facts about the situation. 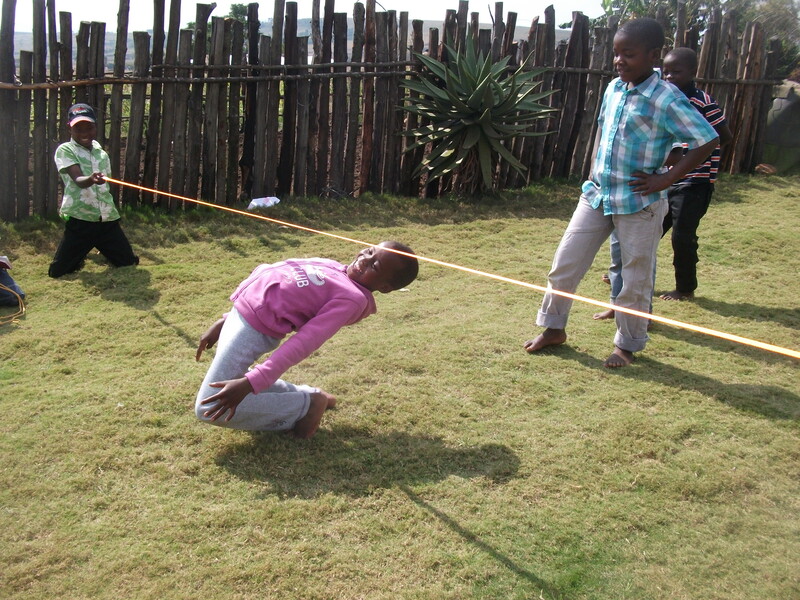 Please pray that we may have God given wisdom and discernment to help Tholakele. 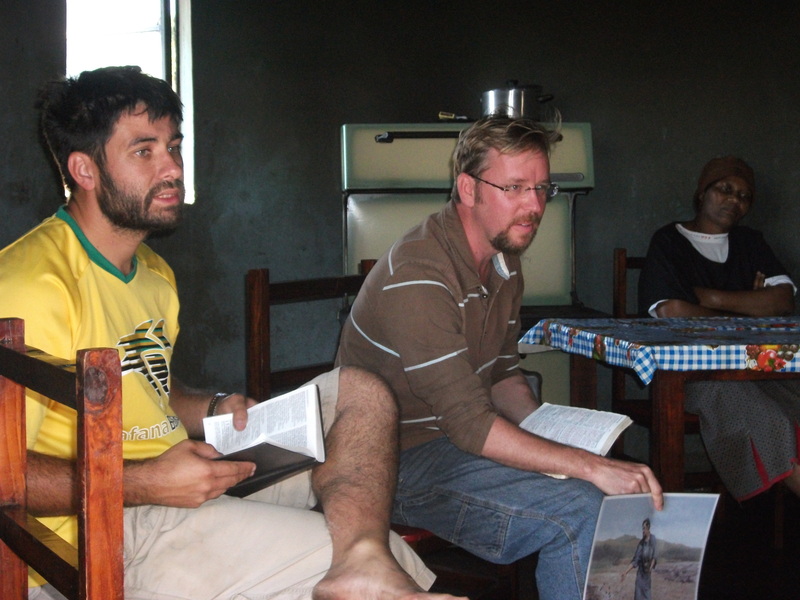 On the May 5th, Salvi went to preach in Bethany Baptist Church as Jannie, the Pastor, had asked. The message was well received and encouraged the brethren. 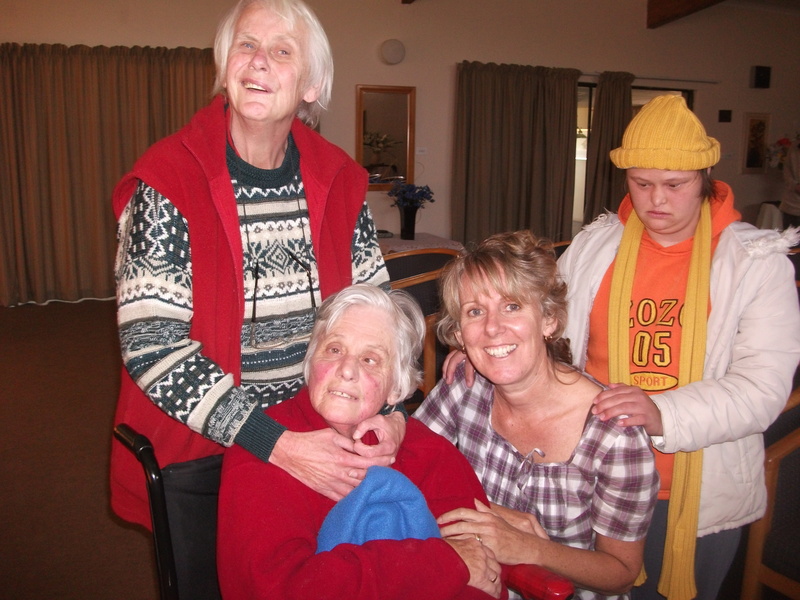 Di has been helping one of the church members, Magda – who works at Genrod – to set up the church library there. Slowly books are being added and various audio teachings by good bible teachers. Di also that week taught at the care bear crèche and the kid’s club. 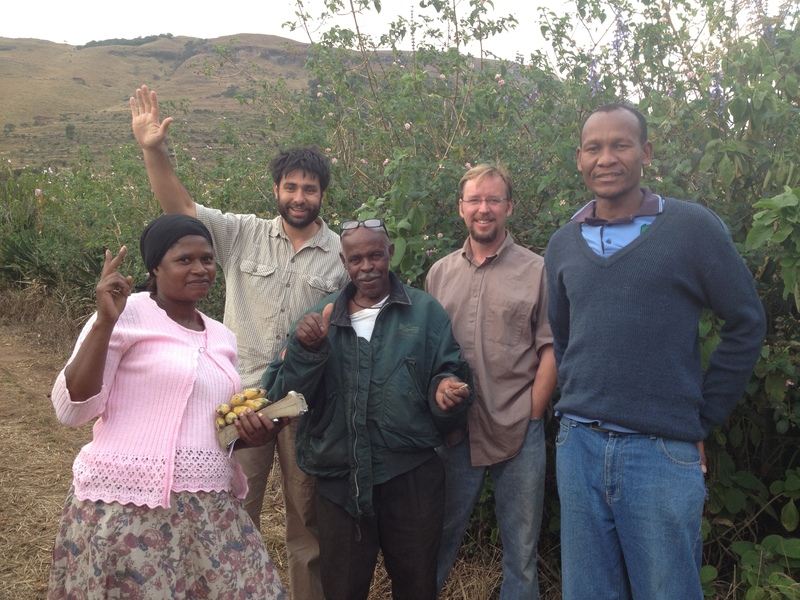 Our friend Caleb, whom Salvi ministered alongside in KZN between 2002 and 2004, came to visit the work this month. He just caught his standby flight back to the United States of America last night. Before we came to Gauteng to fetch him we went to minister to a lady in Louwsburg whose boss had asked us to come and witness to her. When we arrived in Louwsburg we found that there was a huge demonstration and blockade in the street stopping any cars from entering or leaving the little town. There was war dancing, singing and burning of branches in this protest. These protests need to be handled with care for they are those protesting are easily provoked into violence as they work themselves up into a frenzy. Di needed to get home and so we couldn’t stay to wait for more police to arrive but this was so much on Salvi’s heart that he came back and witnessed to Zandile who gave her life to the Lord. We will be visiting her again soon to see how she is and whether or not she burned her ancestor and witchcraft things as she said she would. 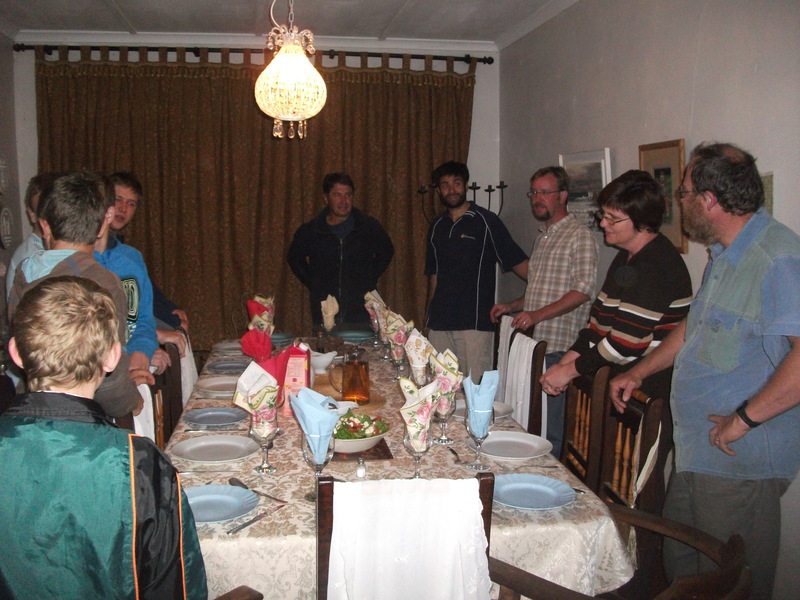 Before Caleb arrived in SA we used a few extra days to visit brethren and churches. 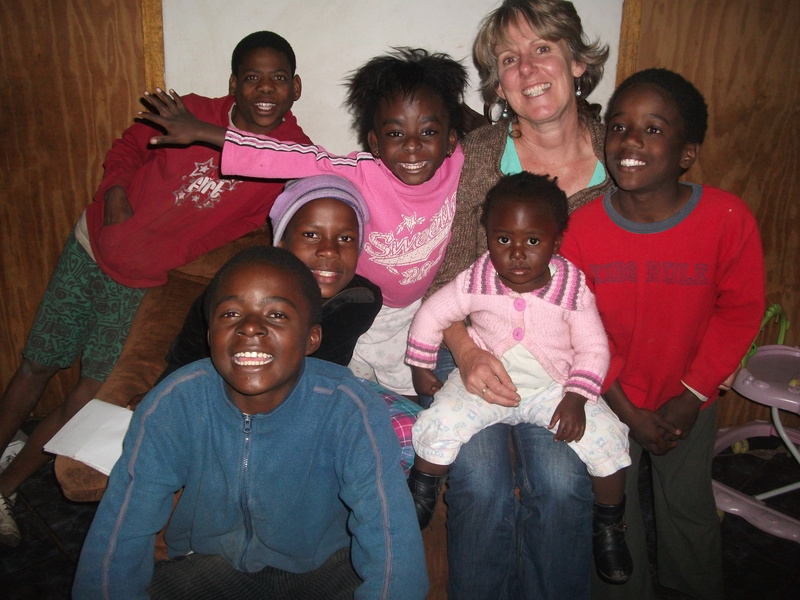 We travelled over half way between Johannesburg and Botswana to visit a precious family called Riaan and Debbie Roux. They have continually had a hard walk. Riaan is in construction and as many other people in the construction have to contend with Riaan has found a lack of willingness from clients to pay for work. They testified to the encouragement of the visit and in their area they are starved of meaningful and biblical fellowship. 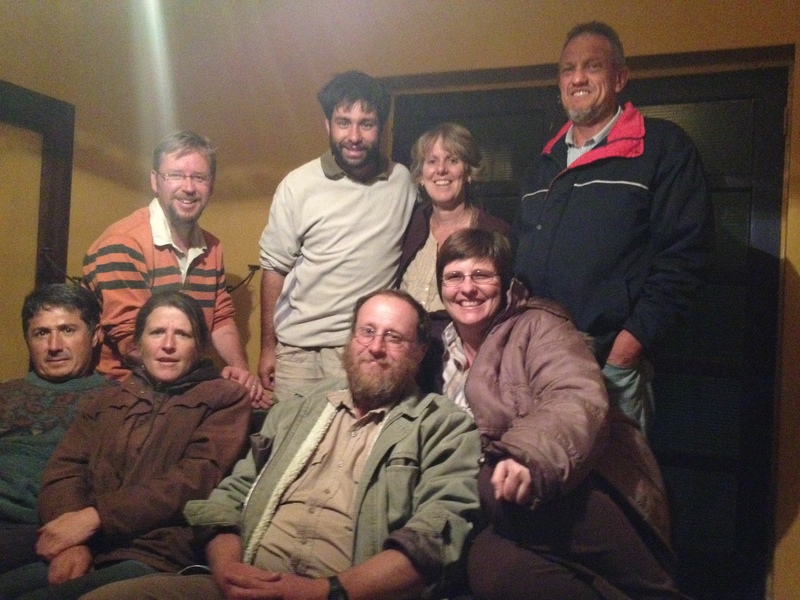 The Saturday saw us in Roodepoort visiting Mark and Paula Hibberd who are involved in Home Churches on the west rand. These home churches are also related to Clayton and Mujuru’s home church in Pretoria. 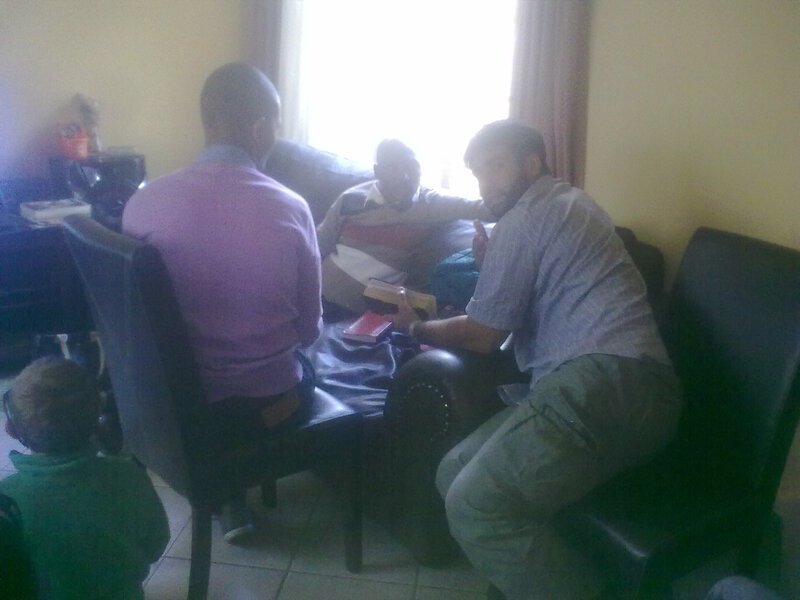 Salvi spoke at the Pretoria home fellowship on Saturday evening and then in Roodepoort and Randfontein on the Sunday. We were very encouraged by the sharing, fellowship and contributions of the fellowships. The discussions that arose from the teachings were a huge blessing and we feel so blessed to be linked with these brethren. We also visited the guys with special needs at Vita Nova in Springs to lead them in hymns, choruses and to share the word of God. This was a great blessing to us and they always are. Having the ability to stay with Allen and Sue Wells and all the kids at Bezaleel is also a huge blessing as we share our hearts and what we have been learning from the Lord. The night before Caleb arrived Salvi managed to purchase a replacement vehicle for Phumlani’s truck that was stolen. As we had said that the previous truck was his and registered on his name we felt an obligation to use the funds that had been given to specifically replace that vehicle to do this for Phumlani. The bakkie needs a lot of work to be done to the body but is mechanically sound. 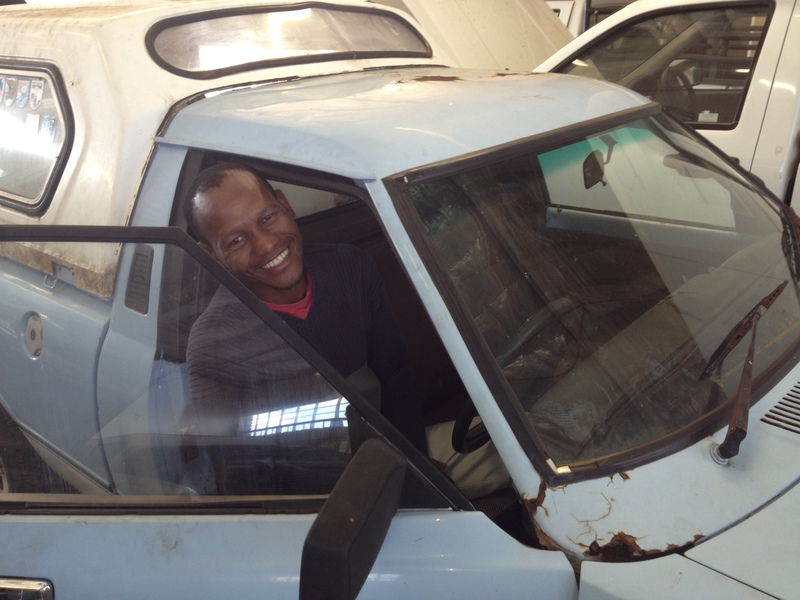 Phumlani is going to work with Craig from Genrod on it and the funds that we saved with the purchase will be used to do the vehicle up. After Caleb arrived we have kept him busy. Phumlani had him preaching at church and we have had him teaching kids club twice with Celani’s permission, teaching cell group as part of our marriage series we have been going through, teaching at the Alpha cell group, doing a hermeneutics session with the Bethany Baptist Church and with the Friday night bible study at Jonny and Kim’s place and also preaching the gospel in the Khambi community. 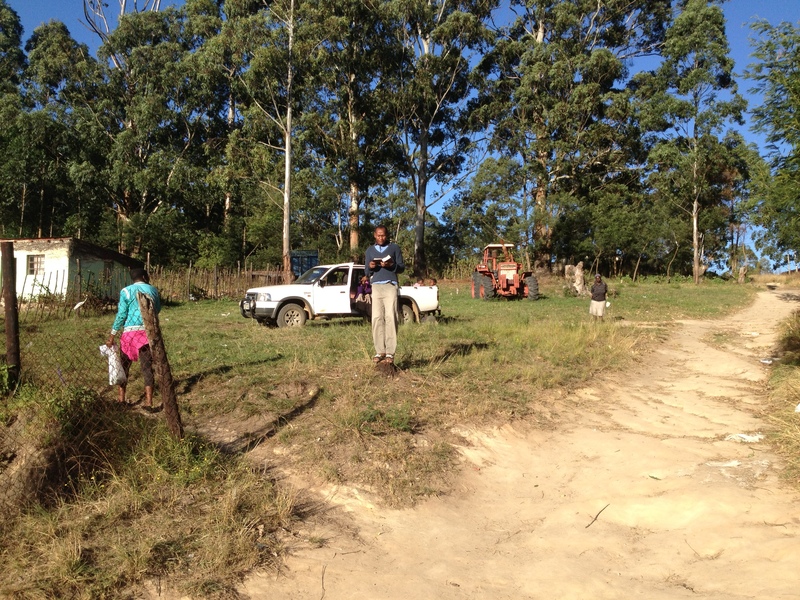 In between all this Caleb, Phumlani and Salvi picked up a whole lot of materials generously given to us by a farmer on the other side of Vryheid. 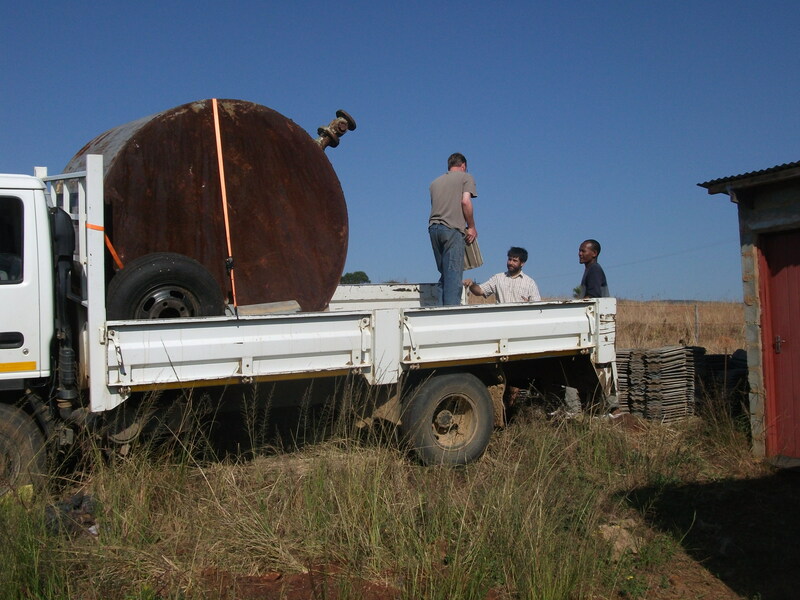 He also gave us a huge metal tank that we could use for water which we were giving to Phumlani. But when we arrived home we saw that if we put the tank down we would never be able to move it into the right place as it was so heavy. We decided to leave in on the truck and sell it for scrap. We then we able to by a 1000 litre water jojo tank for the same price as was given for the metal tank. We are grateful for this farmer’s generosity. 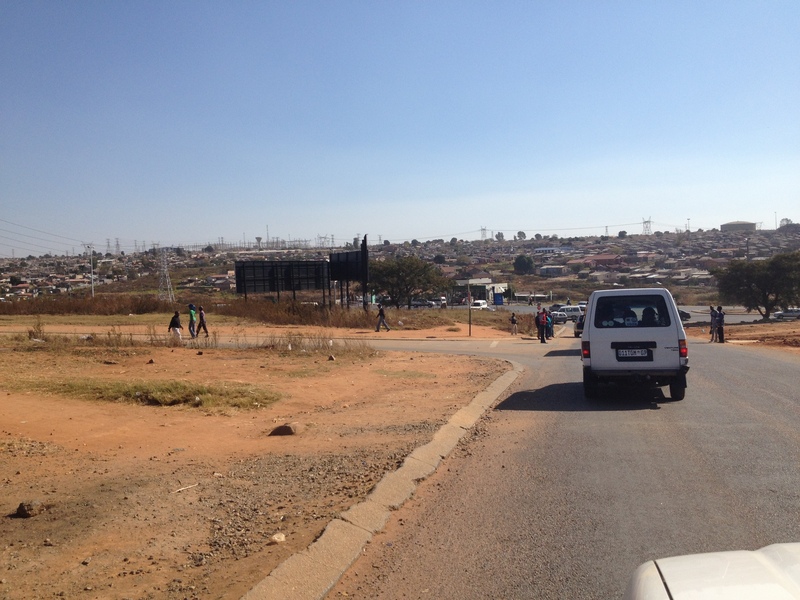 After kids club this Saturday we travelled to Gauteng making to stops along the way. 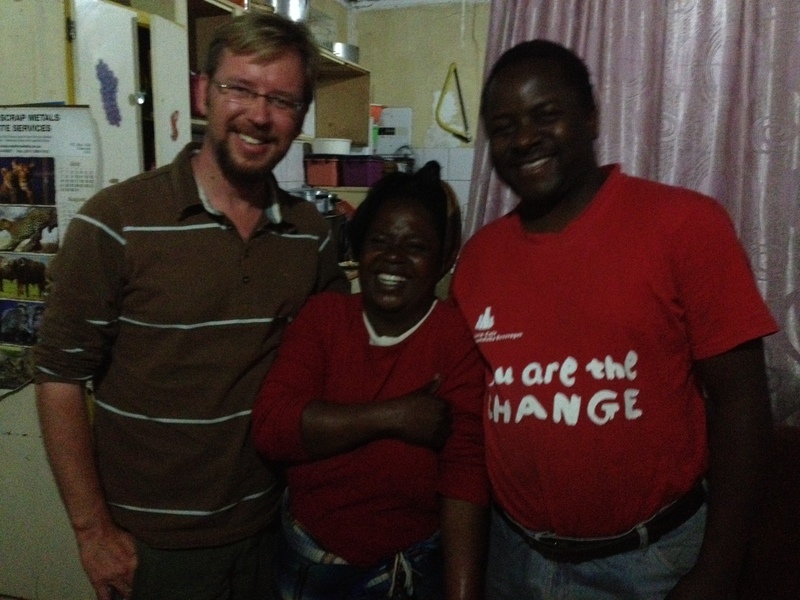 Firstly we visited Veronica in Secunda who, with her husband, have prayed for us every single day. The fellowship was short but sweet. Then in Endicott we visited Bernard and Mabel Mathe. Bernard and Mabel have been having it hard the last while but they faithfully run their crèche, though they make little for themselves. Having government funding enables them to pay their staff. But there is talk of mines coming into the area and people living in Endicott having to leave, because of the health risk, with the mines giving them compensation. The problem is that people are not sure if the compensation will be to the value of their properties or will be short changing them. 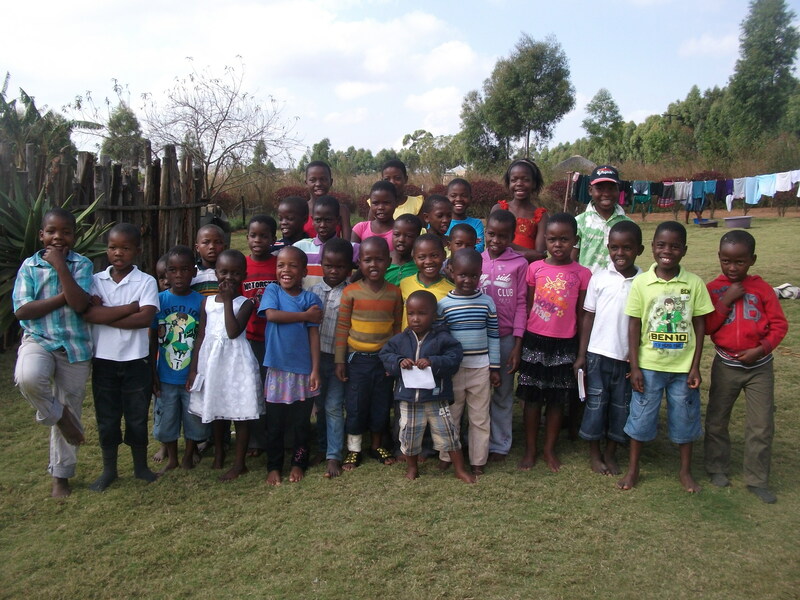 Bernard and Mabel have given us three boxes of children’s bibles in Zulu that were donated to them. We praise the Lord for this answer to prayer which Di had been praying for concerning the younger kids in the kids club. What an encouragement that in difficult and adverse circumstances the Lord is still able to use us to bless others with God’s word, His wisdom, His guidance and with His many other gifts. 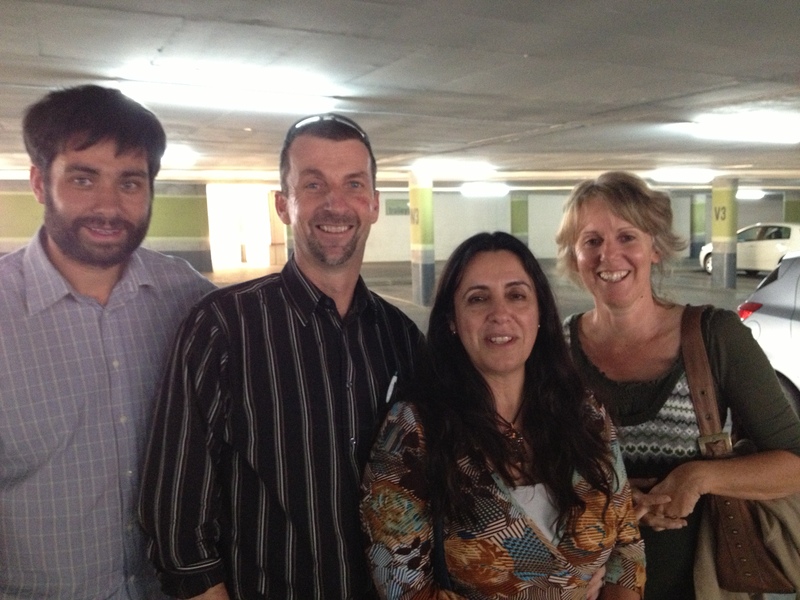 We praise the Lord that on Sunday we met up with Tony and Maria Verlaan. 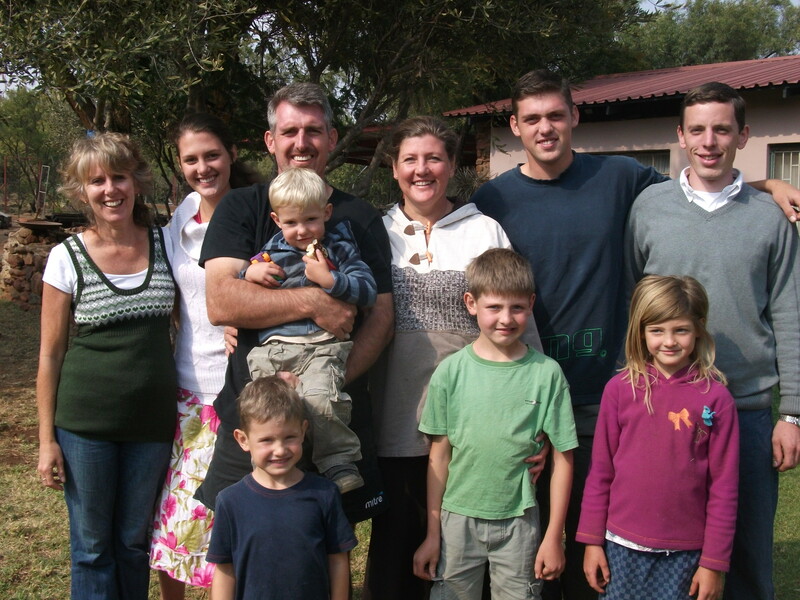 They are an Australian couple working in South Africa for New Tribes Mission. They took us to a house Church in a Township called Thembisa. Thembisa has a population of over 511,000 people with all kinds of churches there teaching all different kinds of things. So what a pleasure it was when we heard Sikelela preach pure truth in isiXhosa and in English. This church seems to be a hidden gem. We look forward to getting to know them more and seeing what relationships might develop between them and other like minded believers. This meeting was followed by a wonderful time of fellowship with Tony and Maria. So wonderful to see likeminded believers in the body of Christ and believers with much missionary experience and older in the faith. Fellowship is vital these days and we need a visible demonstration of the love and grace of Christ between brethren as much as we need faithfulness to right doctrine. May the lord bless and keep you all. Until next month !! That is why the book of revelation bears relationship to people of every time. There will be one big antichrist, maybe even in our life time he will be manifested. However when people said that Hitler was the antichrist, or Stalin was they weren’t totally wrong to think they were antichrists. There are always antichrists. These antichrists foreshadow the ultimate one that will come. Because antichrist is not only a person but is also a spirit. That is why in 1 John 2: 18 it says that antichrist is coming, even now many antichrists have appeared, from this we know it is the last hour. And the main bulk of Revelation deals with God’s judgment on a world that hates the concept of God’s Law and God ruling. They want to have all the blessings of the Messianic kingdom without the true Messiah. They want a Messiah chosen by themselves rather than chosen by God. God is angry with sin, God hates sin and so God must punish sin. And yet God is still love. God is merciful and so what we have, I believe in the scripture is a patient God who has come to the end of warnings, who has waited over 2000 years for people to repent and therefore has said enough is enough. We think that things are not that bad. We think that things are going to get better, but when we turn on the news or pick up the paper we see that things are not getting better. In South Africa, since Apartheid ended, which was a racist regime and should have come to an end, there has been more robberies, more violent crime, a greater spread of AIDS, more corruption. In Genesis 17: 13 – 16 we would read that God would wait 400 years for the sin of the Amorite to be filled up before judging them. That is called long suffering. When we are wronged after a few times within a year we will start to take action against that person but God is patient. In Revelation you have a treading down of Christians and Jews and unless God does something there is an annihilation of the testimony of His truth, to which He promised that man is like the grass of the field, the grass whithers and falls off but the Word of the Lord endures forever. God is judging humanity which is under the Antichrist and the rule of Satan himself. Has God therefore stopped being love? I don’t believe so. I believe that even in God’s judgments there is still mercy expressed in the way those judgments are brought about. God never once will ever lose control of His anger. I want to look at the preludes to the three types of judgment in revelation and see what they teach us concerning this issue. We will start with the prelude to the seal judgments, then onto the trumpet judgments and then finally onto the bowl judgments. Each set of judgments is more drastic than the former. In the seals we see things that are similar to what we hear about today. The first two seals indicate that this is a future event because the white horse goes out and then peace is taken from the earth after. (Rev 6: 1 – 4) In order for peace to be taken from the earth, there has to be a temporary peace brought about for peace to be taken away. But after that we deal with stuff like famine, a ¼ of mankind killed by sword, pestilence and wild animals and famine. At the end of the seals is something drastic, the great earthquake. Then in the trumpet judgments it gets worse. A 1/3 of all the earth, trees and green grass is burned up, a 1/3 of the sea becomes blood and so on. But the bowl judgments are the worse. The whole sea becomes blood, all the waters become intoxicated. There is severe sun burn on those who take the mark of the beast and huge darkness over the antichrist kingdom. Where is the mercy in that? Let us start by going to Revelation 4. Before we get onto judgment we start with the throne room of God. The throne room of God is a heavenly tabernacle and its whole characteristic is holiness. The first statement about God made in this room is found in verse 8 where the 4 creatures call God, ‘Holy, Holy, Holy’. The scene takes you back to Mount Sinai where there are terrible peals of thunder and flashes of lightning. It was before the throne that Isaiah balked at being a man of unclean lips. The Israelites at mount Sinai in Exodus 19 touching the holy mountain while God was on it meant death. Only those consecrated could go up the mountain. There were loud trumpet sounds and in Exodus 24: 10 the elders would see up the mountain to the LORD and under his feet was a pavement of clear sapphire like the glassy sea in Revelation 4. In heaven the Lord, sat on His throne, is surrounded by Cherubim. This is just like the mercy seat on the ark where God’s glory manifested between the Cherubim and this mercy seat, (lid to the Ark) was in the Holy of holies where the priest could go only once a year to make atonement for the sins. All eyes would watch the priest go in. We are now told to come boldly to the throne of Grace. How is this awesome throne to be called a throne of grace when it is so terrible? How can we call this throne a throne of Grace when this is the starting point for all the terrible judgments that are to follow? Because look at what is round the throne. A rainbow, all the way around. As the preacher, Bill Randles, said it doesn’t matter where God looks he sees the rainbow which reminds Him of the promise He made, not to flood the earth with water again. The next judgment is with fire but the rainbow reminds God of the covenant he made with man. Thus God is patient. God does not delight in the death of the wicked. When Jesus died, the veil that cut man off from the Holy of holies was rent and thus opened the way for all to go in. The throne is the throne of grace because Jesus has made a way for us to approach it boldly without being struck down dead because Jesus consecrates us by His blood. In fact, there is also a sea of crystal there in the throne room. This is called a sea of glass. If you have looked at the tabernacle, there is also a sea there too. It is called the bronze laver, and in Solomon’s temple it was called a ‘sea of cast metal’. (1 Kings 7: 23). This was the place where the priests would wash their hands and feet. It was made of bronze. In the New Testament we also have to have our feet washed. Jesus told the disciples to wash one another’s feet and we know that the washing for cleansing is with the Word of God. The bronze of the laver speaks of judgment in that if we judged ourselves we wouldn’t have to be judged. (1 Corinthians 11: 31). We mustn’t be judged and judge each other by personal sensibilities because that is hypocritical and it is putting ourselves in God’s place but we are to judge only by the Word. The aim of this must only be for the cleansing of self and others. In other words we help each other on the road of sanctification. When we become Christians we are saying to God, ‘Change anything about me that You want to. Take anything away or add anything You want to. I am not my own anymore, Lord I am Yours.’ Above this sea we sea a throne of grace. Judgment starts with the house of God. That is what Revelation 2 – 3 was about. A two edged sword, the Word of God, came out of Jesus’ mouth to separate all that is profane from the holy. If we endure and persevere with the Lord’s discipline. If we are standing on it, then the throne is a throne of grace. But if we are under it we become like the Israelites, fearful of their lives because there is judgment. If you read Ezekiel 1 we see the something like the throne room but from under the glassy sea. It is seen as an expanse of something like crystal. Above the expanse is the throne and below are 4 living creatures very similar but not identical to the ones in revelation. In chapter 10:15 we read that these living beings are Cherubim. But in the midst of the Cherubim there are burning coals darting to and fro. In chapter 10 a man clothed in linen is told to go in between the Seraphim and to fill his hands with coals and to scatter them over the city of Jerusalem. This signifies God’s judgment over a people whose spirituality was relegated to meaningless ritual, a people who adopted the worship practices of other religions and mixed them with the Temple worship of the Lord. These people to whom the true God seemed less real than Tammuz, or the sun. Their religion was a joke and God was angry at having His glory perverted and stained. You see above the sea it was a throne of grace but below the sea it was a throne of judgment. If we would judge ourselves by the Word of God, then we would not have to be judged. If we enter into a life of sanctification then God’s throne is a throne of Grace. You were not redeemed with perishable things like Gold or silver but with the precious blood of the Lamb. Blood that can wash away every sin and clean you. You are not saved just so that you can stop yourself from going to hell, or to be a part of the church group. You and I are saved to be like Jesus. This is the predestination that God foreordained before the world began, that those who are in Christ would not only be in Christ; but would be made a brother to Christ and share the inheritance with Christ. This is God’s work in you. But you must want it. Do you want to be made like Christ? You must seek after him, no religious games! Work out your own salvation with fear and trembling, not in your own steam but because it is God who is at work in you to will and to work for to His good pleasure. It is a partnership between us and God because God is a relational God. There is mercy in judgment. But then in Revelation chapter 5 we see that God on the throne has a book in his right hand which is sealed up. The book is a book which contains judgment. The seven seals on the book unleash judgments. Now, what right does God have to bring these judgments on the earth? Verse 11 of chapter 4 tell us that the 24 elders sing that God is worthy of all glory and honour and power. Why does God deserve all that? Because He created everything and everything was created for His pleasure but for some reason most of our human race couldn’t care to give the creator the time of day. We owe our very breathe to Him and that is why He should be number one in our lives. Did you never ask those questions when you were a kid? Who am I? Where did I come from? Where did the stars come from? Why do we have the impulse to ask those questions? Because a sense of identity is integral to what it means to be human. And our identity is bound up in our creator. The greatest sin, worse than murder or theft of embezzling money is to turn our backs on the one to whom we owe our existence. What is antichrist about? Making himself to be like God. We decide to be gods in the driving seat of our own lives and no god, no christ no nothing is going to tell us what we should and shouldn’t do with our lives. This deserves judgment. If you break national law you must face the court and if you are found guilty you must pay the price for your crimes. If you are guilty it doesn’t matter how many old ladies you have helped cross the road or how much charity you have given, the price still has to be paid. All you can face is judgment. Where is the mercy in that? But the cry goes out in heaven, ‘Who is worthy to open the book and to break its seals?’ And there is no one in heaven, on earth and under the earth who is worthy. Now we are talking of gizzillions and gizzillions of beings who have ever existed in the physical and spiritual realm and there cannot be found even one, who can open the seals! What is John’s response to this? He starts to weep. John is not weeping out of curiosity to know what is in the book. That is not why he is crying! John has been suffering in Patmos for the word of God. John would have known many, many believers martyred for the faith. Unjustly killed. John knows how this world is not what it should be and we are in a mess. He knows that God has promised to restore the fortunes of His people Israel. But now there is a problem, no one can open the book. Were the believers suffering for nothing? Where is the justice in that? You think if someone were to take a sword and mutilate a baby. What if the judge showed that person mercy and let him off. The nation would be incensed. So on the one hand when judgment is rendered we cry ‘Where is the mercy?’ But when wicked get off we cry ‘Where is the justice in that?’ That is why John is crying; where is the justice, who is going to set all the wrongs right?’ And then John is comforted. One of the elders says in verse 5. Stop weeping, the lion from the tribe of Judah has overcome. This powerful ruling creature is coming and yet what does John see? He doesn’t see a lion, but he sees a lamb. Weak, having been slain. Defenseless. In this world might is right, but God’s wisdom supercedes the world. The message of the cross is foolishness to the world but to us it is the power of God to salvation. Blessed are the meek for they shall inherit the earth. Why meek? Because God will set right all the wrongs, we don’t have to start a violent, anarchistic revolution. Here the Lamb comes to set right all the wrongs, to bring judgment. But why a Lamb? Why did Jesus have to appear as a Lamb in order to break the seals? Because the Lamb is the animal of sacrifice to take away the sin of the world. In other words no one can point their finger to God when the judgments come and say, ‘It’s not fair God, you don’t love us, you don’t care, this is not just’; because it is the Lamb who brings the judgments. The reply for those who accuse God is, ‘Look, I did everything to spare you from this judgment, because I love you.’ For God so loved the world that He gave His only begotten son, so that whosoever believes in Him shall not perish but have everlasting life. Jesus has saved people from every nation and therefore He is in full rights to bring judgment on an unbelieving world. Where is the mercy in these judgments? In the Lamb, there is mercy in the Lamb. The second set of judgments starts in Revelation 8: 1 – 6. These judgments start with half an hour of silence. There is mercy in this judgment, with God’s patience. The anger of man is uncontrolled and is something that flies off the handle. God is not like that. That is why God can say in Psalm 4: 4 ‘Tremble with anger, and do not sin.’ This is called righteous anger. God is in full control and reveals His anger in a controlled fashion. In heaven, before the trumpets are sounded there silence. Everything is orderly and there is a sequence of events. No angel is allowed to run riot. The shofar, the trumpet is an instrument of warning. Trumpets in scripture, especially in Numbers 10: 1 – 10, were there to call people to an assembly or to sound an alarm for battle. We see the use of 7 trumpets in the downfall of Jericho in Joshua 6 where they marched round the walls once a day for six days and then on the seventh they were to march round the city 7 times and then they were to blow the trumpets and shout. Thus the walls fell down. God is declaring war on the Kingdoms of the world in Revelation. He will take over and put an end to the corruption and the evil. He will install His kingdom. So where is the mercy in that? These judgments only touch a third of the earth. This isn’t even the full manifestation of God’s wrath. It is still only a taste of what is to come. When these things come God is saying, ‘Wake up, I am taking over, the end has come’. We live in a world where politicians carry a connotation of being corrupt, power hungry people. Dictators are treated with disdain. Jesus is coming back to take it over. His mercy lies in the fact that he has given clear signs before it is too late to turn back. And lastly there are the judgments of the bowls of wrath. We see in Revelation 15 that in these bowls the wrath of God is finished. In other words it will be completed. Whatever went on before, was just a taster of these judgments. How long or quickly these judgments go on for is not stated any where in the text but they are terrible. Where is the mercy in God’s judgment here? Firstly we see that those who had been victorious over the beast and his image are on a sea of glass mixed with fire. In chapter 15 they sing something called the song of Moses. You can find the song of Moses in Exodus 15 but the words are very different in the two songs. So what is the link between them? In Exodus Pharaoh was the king who oppressed the people of God. God sent plagues on his kingdom so that Pharaoh would let God’s people go. Pharaoh’s armies chase God’s people and after Israel walk through the red sea, Pharaoh’s army is destroyed and Israel are taken away. So here too, there is another type of Pharaoh in Revelation 13: 7 who makes war with the saints and over powers them. God sends plagues, which we have seen and then God is about to bring his full wrath and here we find these believers are out of the tribulation. In their weakness they overcame. How did they overcome? Not in overthrowing the antichrist but as 12: 11 says, they overcame Satan because of the blood of the lamb, and because of the word of their testimony, and they did not love their life even till death. These judgments of the bowls, being the worst judgment seems to show less mercy, but not to the redeemed because the redeemed are delivered. I am not going to say when I think the rapture is. We should agree that it must be before Jesus sets His feet on the mount of Olives. But here, though I do not place the rapture here, we see saints who have been victorious spared from the bowls of wrath. This is after the two harvests in Revelation 14. There is a reaping harvest in verses 15 – 16 and then there is a harvest of grape clusters which is a harvest of blood shed in verses 17 – 20. It is only after the harvests and the victorious saints are on the sea of glass that the bowls of wrath are handed out to the angels. But there is one more manifestation of God’s mercy in judgment. Read verse 8. In this verse we see that during the 7 bowls of wrath, the temple is filled with smoke and no one is able to enter the temple. Why do you think that is? Because man, angel or any other created being would not be able to take it! Therefore God puts a restriction on His wrath and a hedge of protection around His people. God is totally unlike us. He is so high and Holy and we cannot perceive the burden that God carries. God is holy and must judge but God is a God of mercy too. He has done everything that we might be recipients of his mercy. Mercy in judgment but for you and mercy a choice between God’s mercy or His full judgment. 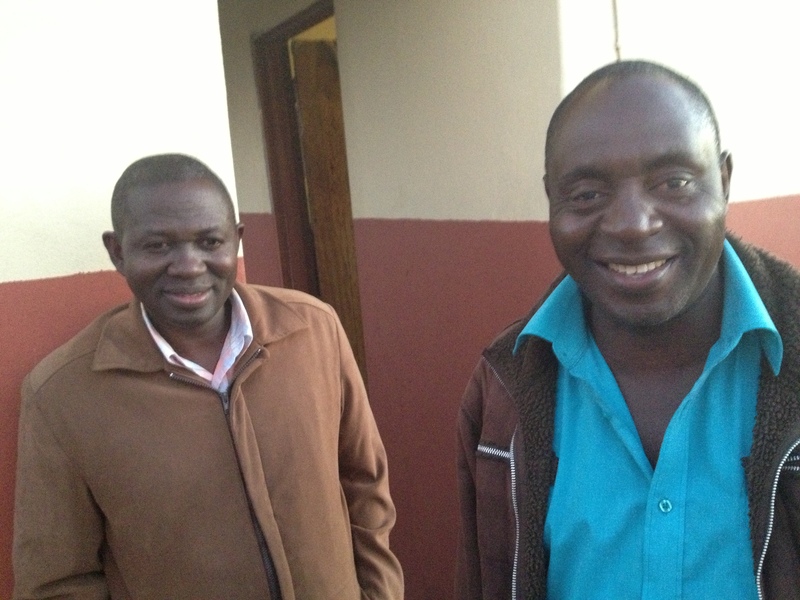 Trust Moyo on the right who runs a home church in Khambi. We are blessed to know him. Bernard and Mabel Mathe’s Chidren. Panoramic inside shot of other half of the house… And no we are not 1599 Geneva Bible onlyists. lol.